Mark Giroux grew up poor. His parents made and sold Christmas wreaths every holiday season to afford Christmas presents for him and his six siblings. The whole family helped, scavenging the woods for brush, assembling the wreaths by hand and selling them door-to-door. At first, they supplied wreaths to a local businessman, but before long the family struck out on its own. Eventually Giroux took over the family business, dubbed it Mark's Vermont Christmas Wreath Company and expanded it into an enterprise that now spans much of New England. Throughout the holiday season, Giroux, his wife, their four children and an assortment of friends make and sell thousands of wreaths and garlands, he says. They store the wreaths, priced from $34 to $100, in a Derby warehouse, then drive across the region, delivering them to a vast network of annual clients and soliciting new ones along the way. Giroux, 50, recently took time out of a busy day of dropping off wreaths to talk about his unusual gig. SEVEN DAYS: I know you devote a lot of time to door-to-door solicitations, but do you get more customers through your website these days? MARK GIROUX: Door-to-door, that's how we get almost all our customers. Maybe every 10th door you get a yes. When you're a kid and a lot cuter, it's more [conducive] to sales. I'm 50 and bald now, so it's different. My kids go out and take orders now. They do well. SD: How long do your wreaths last? MG: Outside, no sun, until April — let's say at least March. But there are variances. In offices, three to four weeks, if you put them in a window with a lot of sun. SD: Wreaths seem like something that consumers could cut back on in rough times. Why have they been such a reliable seller for you? MG: It's in my blood, I guess. We have a quality product. We strive for nice, thick and fresh, and we have a good following. We just switched to Fraser fir wood. Not so fragrant, but more tolerant to heat. You can make an awesome wreath and, two weeks later, if the sun is hitting it right, bang — it's brown and it's our fault, and [people] are not so eager to buy from us next year. Fraser, it's more work. It's thicker than what the wreath makers want. But we got a [Fraser] Christmas tree, and it just tolerated the heat so well. I want my wreaths to hold up. I want to have a nice product. We've changed with the times; we've stepped it up. The burlap ribbon instead of velvet, things like that. The burlap ribbon has been a big hit. SD: What is your best market? MG: I've got good clientele in Chittenden County — [that's] the hot spot. We do a lot of car dealerships, all the small businesses. We do a lot of business in Manchester, N.H., and Springfield, Mass. On Sunday, we left at 8 p.m. and went to Portland, Maine; Manchester and West Hartford, Conn., and got back at 7 p.m. on Monday. It's not a walk in the park. It's not the lollipop world. It's hard on the family. The family is tired. 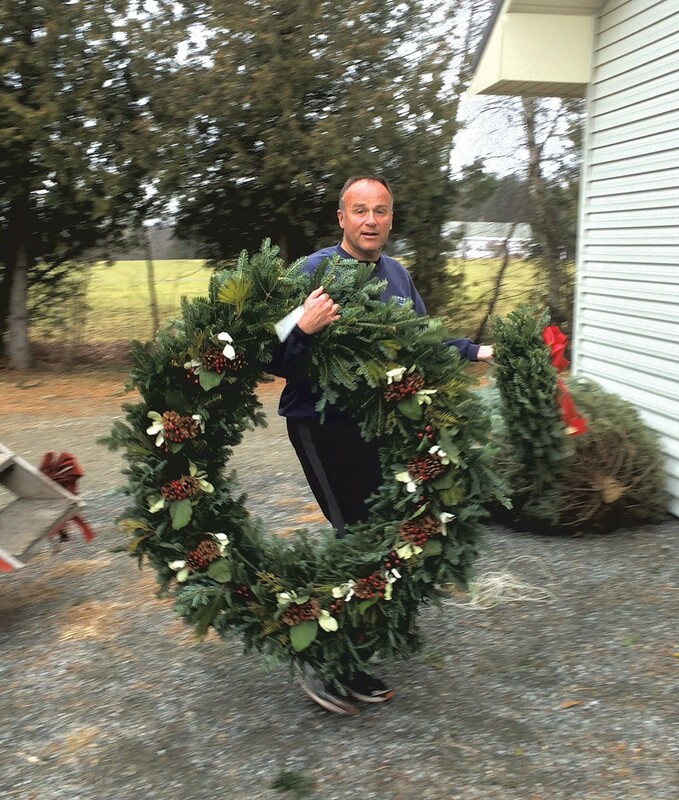 The kids do all aspects of the business: gathering brush, wreath making, whatever it takes. My mother's been making all the ribbons for 35 years. If it weren't for my wife ... It should be called Amy's Wreaths; my wife is the organizer. She married into it, but she's the real deal. And the guy who delivers with me has been doing it for 15 years. We've got the right people, we really do. It's not just me. SD: With tighter security, has it become more difficult to do your office sales calls? MG: Yes. A lot of offices, you can't solicit too much because they are cautious about the amount of time you take. I try to be in there for 30 seconds to a minute. Employers don't want you taking up the employees' time. I understand. I try not to go in there and be too loud. I try to keep my voice down. That's how I roll. I don't really deal with the customers as much as I used to. SD: Where do you get the brush? MG: We go out into the wild to cut brush. And we look for tree farmers with Fraser fir trees. If you find an overgrown orchard, which is what you shoot for, [you can take] the brush on the ground from whatever they cut. [But] you've got to pay. Disclosure: Giroux's client list has long included Seven Days. The original print version of this article was headlined "Holiday Rounds"